As global K-pop fans flocked to YouTube last week to watch the new BTS video “Boy With Luv,” the band celebrated the release of its new album with a special event for loyal fans around the world. 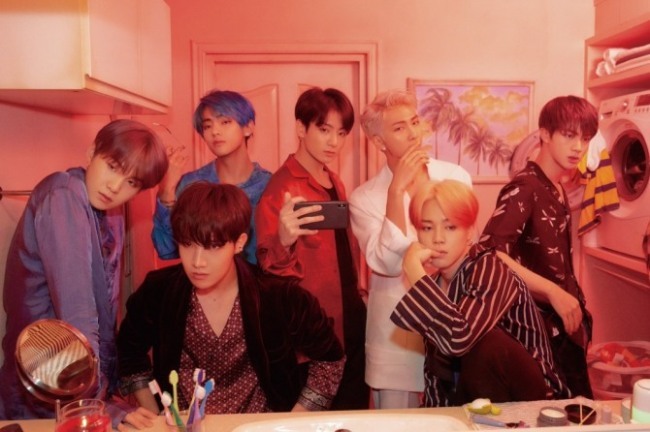 It was a live broadcast from New York City, where BTS discussed the new album, “Map of the Soul: Persona,” with global BTS Army fans. The event preceded the band’s much-anticipated performance on “Saturday Night Live” alongside guest host and “Spider-Man” actress Emma Stone. “It was the first time since its new album release that BTS went on air to say hello to their global fans,” Han Ah-reum, who heads the business department at Naver’s V Live, told The Korea Herald on Saturday. While Han and her team had launched similar streaming events over the past few years whenever BTS released new albums, the boy band’s recent global success made the stakes higher than ever before. It was important to ensure that the live broadcast reached its global audience without any glitches. When BTS first released its new album, there had been complaints about a connection issue with the Korean music-streaming app Melon. Seamless translation was also crucial, since the band members usually converse in Korean. The need for sophisticated translation services has grown because global fans want to capture every word their beloved stars say. Since 2015, when BTS began providing its content on Naver’s V Live, about 13 million users have subscribed to the platform’s BTS channel. According to Han, there are about 1,000 channels operating on V Live, and about 60 percent focus on K-pop content. While BTS and K-pop in general are the major engines for V Live’s growth as a global platform, it’s a tough challenge to go up against the likes of YouTube and Twitter, which are beginning to treat K-pop content as a new source of revenue. Given the intense competition over K-pop platforms, Han said Naver’s edge is its ability to deliver tailored content for its target audience. Through strong engagement with local entertainment firms, the Korean tech giant can understand who the fans are and what they want, Han said. “V Live’s competitiveness is in its capability to create core fan bases and keep them growing constantly,” said Han. “While YouTube might be faster in delivering the content, we are better at turning it into sophisticated content. “If there is one significant advantage for us compared to global platforms, we can speak the same language as the entertainment companies. … They trust our ability to achieve something that they had only envisioned by themselves,” she added. According to Han, about 85 percent of V Live subscribers come from overseas. Topping the list is Indonesia, with Korea being ranked second. She also said 82 percent of V Live users are women in their 20s, with 67 percent of all users aged under 24. Based on such analysis, Han said V Live plans to develop contents that can appeal to young women with a focus on Indonesia -- a country that shows little difference in concept between celebrities and influencers. In order to boost engagement with global fans, V Live has launcatest premium service, called Fanship. The service was launched last month with five K-pop stars participating: Stray Kids, Sunmi, Chungha, Kard and Momoland. The idea behind Fanship is to let the stars manage their own fans and offer exclusive benefits. Fanship subscribers can purchase concert tickets before they go on sale to the general public. They also enjoy exclusive opportunities to take part in various activities with the stars. While helping Korean entertainment companies expand their business opportunities, Fanship has also given global fans unique opportunities to interact with the K-pop stars they adore, Han said. According to Han, Fanship also allows young K-pop stars to promote themselves to a global audience. For example, there were no official fan clubs for Sunmi and Chungha until the launch of Fanship. The service operates on subscription fees, with different price tags depending upon on the duration and specific benefits. A basic subscription is 4,400 won ($3.84) per month, and a premium subscription is 66,000 won per year. While fans in Southeast Asia might be reluctant to sign up for paid services due to lack of internet infrastructure, Han said the company was confident that it would gain a foothold in that region as well, considering the value of premium content. “Of course, one could assert that it is unfair to charge the same amount of money in countries with different prices and infrastructure. For example, the US and the Philippines have totally different internet and telco environments,” said Han.